Colin Coffey (‘19) winds up for the pitch during a game. The Luther baseball team finished the 2018 season this past weekend in Cedar Rapids, Iowa, going 2-2 in the conference tournament. The final loss of the campaign came 8-4 at the hands of Coe College. The Norse, who were the number five seed in the tournament, started off with a 7-0 victory over Loras College. That was followed by an 11-1 loss to eventual tournament champion University of Dubuque, and then a thrilling come-from-behind 6-5 win against Buena Vista University before their loss to Coe in the third round of the consolation bracket. Arguably the Norse’s best all-around performance of the weekend was in their first game against Loras. 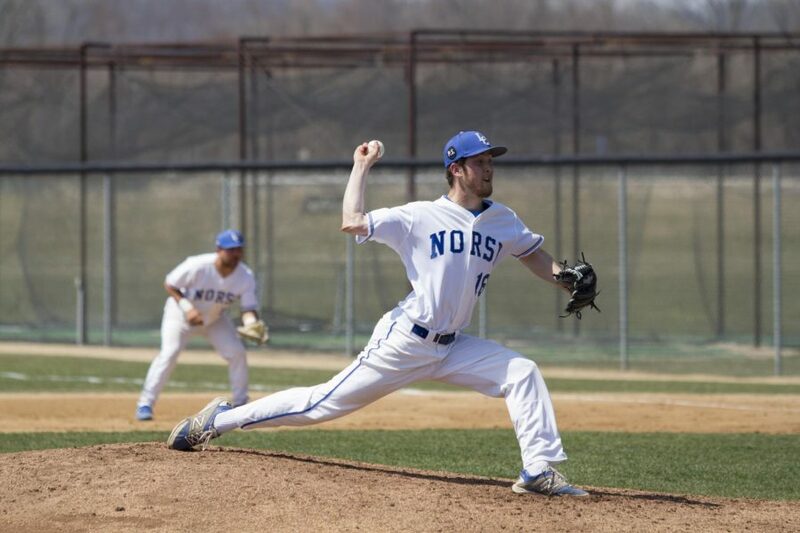 The Norse won 7-0, pounding out 16 hits at the plate as Joey Cardamon (‘19) threw eight innings of shutout ball while giving up no runs on eight hits and striking out six batters. The Norse’s lineup was in large part led by centerfielder Jake Vogt (‘19) who had two hits in six at-bats on the day. In the next game however, Luther did not repeat the hitting barrage and stellar pitching performance it showed against Loras, as the Norse only collected four hits and made three errors in the field in an 11-1 loss to the number one seed, Dubuque. Dubuque went on to win the Iowa Conference Tournament, defeating Wartburg College 11-6 in the final to punch their ticket to the NCAA tournament. What would end up as the Norse’s last win of the season was a special one. Down 5-4 in the ninth with their season on the line, Luther rallied for two runs in the inning coming from Jake Halversen’s (‘19) RBI single to left field and was followed by Trent Athmann’s (‘19) game-winning sacrifice fly to center field that easily brought home the winning run from third in Vogt. With the loss in the next game, 8-4 to Coe, the Luther baseball season comes to a close with a record of 28-18, including 13-9 in IIAC regular season play. It was also the final game in the careers of the three seniors on the team: infielder Mitch Bruggers (‘18), outfielder Gannon Jordahl (‘18), and pitcher Sean Westendorf (‘18), three players who meant a lot to the program over their four years at Luther. The tournament was the last part in what was a memorable season for the Norse players, according to Vogt.